A member of a punk clique scalped another member apparently as punishment for her disrespectful behavior toward women, police said. The victim, a 16-year-old girl whose hair was cut in a mohawk, survived. Authorities are searching for Marianne Dahle, 26, who allegedly tied the teen up and used a 4-inch knife to cut away the crown and back portion of her scalp. A felony arrest warrant accuses Dahle of aggravated battery, which carries a maximum sentence of 14 years. Dahle was visiting Kirkham Hot Springs in central Idaho with the girl and a friend when the attack occurred Jan. 18. The teen spent two weeks in the hospital and is now recovering at home. Authorities did not release the girl's name, though she identified herself as Sheila to Boise TV station KTVB. "When I say this gal was scalped, she was truly scalped," said Bill Braddock, chief deputy of Boise County. "The top of her head, her hair, was completely cut off. The motive, as near as we've been told by witnesses, was retaliation for acting in a way that the adult perceived as being offensive to women as a gender." Braddock said the victim, Dahle and another teenage girl who witnessed the attack were long-term acquaintances who belonged to the same clique. 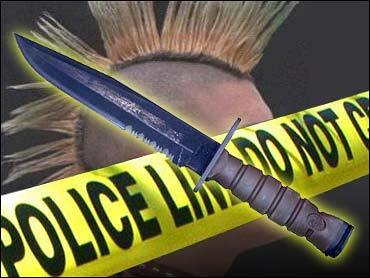 The victim's mohawk hair cut may have played a role in the assault, he said. "In their punk group, wearing a mohawk is a sign of being a punker, and according to their creed if you disrespect women you are not allowed to wear a mohawk," he said. "But I don't think the victim had any idea in the world she was going to be scalped." Sheila, who is from Nampa, near Boise, told KTVB that she thought the woman was going to cut her hair. "Why would they do something like this to me?" Sheila asked. "I thought they were my friends." Doctors grafted skin from Sheila's thigh to cover the inches-long circular patch of missing skin on her crown. She has one operation left. She wears hats to hide the healing patch of skin. The group is not a gang, Braddock said, though they had at least some established rules of behavior. "It was an act of revenge. I view this as a case where an adult female is using predatory control — both psychological and sexual — toward juvenile victims. There are definitely sexual overtones to this crime," Braddock said. No drugs or alcohol were involved in the attack, Braddock said. Police were alerted after Dahle allegedly dropped the teen off at St. Luke's Regional Medical Center in Boise, Braddock said. Sheila said her face and body were covered with blood when Dahle left her at the hospital. Authorities recovered the scalp, which had been left behind at the hot springs, but doctors were unable to reattach it, Braddock said. The Kirkham Hot Springs, about 70 miles northeast of Boise, are popular with campers and hikers, but visitors during midweek in the winter can count on near total seclusion, Braddock said. The case has been difficult to investigate because it has taken deputies time to win the trust of witnesses and friends of the victim. Some witnesses are afraid of retaliation. "Everybody in this case is very fragile and they're worried about how they're going to be judged by their peers," Braddock said. "I have to be very protective of my victim and others who are cooperating." Braddock said he only agreed to discuss the incident so the public could help authorities find Dahle. Police would not release many details for fear it would harm the prosecution's case.